NYC is facing a lawsuit from three drivers who are alleging their red light camera tickets were the result of short yellow lights, and are seeking a refund on their fines. 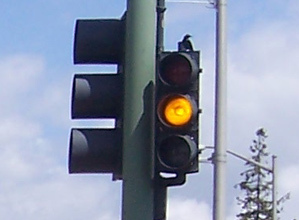 According to the complaint, the city's yellow lights are shorter in duration than the federal minimum of three seconds, and there are also 168 more cameras in use than state law allows. Back in October, AAA's study on NYC red light cameras found that yellow lights were up to 15% shorter than the Department of Transportation's three second standard. The city has maintained that all cameras are working properly and within the correct timing parameters.The program has generated about $235 million in revenue since 2007. The case is Luceno v. City of New York, 654239/2012, New York State Supreme Court, New York County (Manhattan).